When you’ve worked in hospitality there is one thing more precious than anything else. Time. The fast paced action of the floor is social, fun and frantic. But working in such a hands-on and competitive industry makes finding the time to market effectively online increasingly difficult. In this tutorial we explore 4 essential online marketing strategies restaurants and cafes can start implementing today. Strategies that are guaranteed to start increasing their online presence by increasing visibility in organic search and 3rd party website referrals and managing social media profiles. In 2018 Google My Business will be the king of online marketing for cafes and restaurants. Where 3rd party websites may rise and fall, and algorithm changes on social media puts future social marketing at risk Google My Business is set to give cafes and restaurants a breath of fresh air in 2018. For those who haven’t seen it, the change has come hard and fast. Google is now shifting significant focus on local group searches showing places (restaurants) above traditional posts that for years have dominated organic search results. To have a closer look at the significance of local places in search results and why this is important for your business let’s have a closer look at what local search results look like. What are local places in Google search result? A local places search result shows Google My Business listings at or near the top of the search results, often beating high profile websites with lots of domain authority. 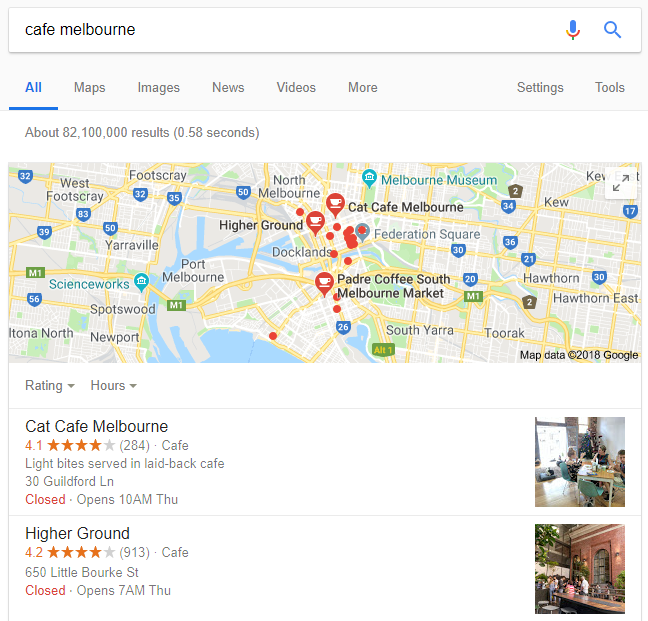 In the below example ‘cafe Melbourne’ was searched and the top results were not the traditional blog posts, rather they feature local search results listing cafes in Melbourne. Take note of top two positions which feature two local Melbourne cafes Cat Cafe and Higher Ground. You nearly need to scroll half way down the page to find the true position 1 SERP, which in this case is Trip Advisor’s post about the 10 best cafes in Melbourne. There is even a button for ‘More Places’ which will show more cafes in Melbourne, and we can even filter the cafes by rating or opening hours. This is a game changer for local cafes and restaurants who usually would never stand a chance unless they were one of the feature restaurants in the Trip Advisor article. It could represent a much stronger shift towards local businesses being shown in search results via their Google My Business accounts over these high authority websites. Create your Google My Business cafe or restaurant profile right now! So first thing’s first. If you haven’t already done so create your Google My Business listing right now. Or if you already have a Google My Business listing take the opportunity to revisit it again to make sure it’s as good as it can be. Here are some of the most important things to watch out for when putting your business listing together. Make sure you only use the registered business name. Google is strict on this one and while they haven’t started penalising businesses yet, if you keyword stuff suburbs or extra descriptive words you might get a hefty penalty. Include both ‘Melbourne’ as well as the local suburb in the address line. Google doesn’t always recognise that a suburb is part of a city. For example if your cafe is in Fairfield and you write Fairfield in the address there is a chance you won’t show up at all for cafes in Melbourne. For the address make sure to include suburb and city, for example: 7 example street, Fairfield, Melbourne, 3078. Make sure the business description, opening hours and services are all up to date and over complete. When I say over complete make sure you give as much information as possible for every possible category. You don’t want to miss anything here at all. Invest in some fresh professional level photography if you haven’t already. If you’re an eager photographer wait for a cloudy day and borrow high definition camera. Alternatively this is when a professional photographer who specialises in food is worth the money (you’ll be able to use these snaps on your social and website later as well). 2. Build your own website. Even if it’s small. As long as your cafe has a unique name Google will give your business preference to your target keywords. It’s actually extremely hard for another business to outrank you organically for your business name as long as you have your own website. This allows you, as a business, to easily own your brand as long as you ensure you maintain that online presence. Do I really need a website for my restaurant in 2018? The answer to that is absolutely YES! But first, I understand your doubts. If you own a cafe or restaurant then it’s likely that you don’t have a lot of time or budget to spend on making a business website. In fact we’ve met successful cafes that have opted to remove their website altogether and focus entirely on social to build their customer base. And when business is good this might seem like a great idea. But the truth is this is a perilous journey, one that you have no control over. When you rely entirely on third party platforms like social media you are essentially trusting the future of your restaurant’s online marketing on the algorithm of a profit driven machine. Businesses like Facebook and Instagram are going to continue to make it harder for businesses to thrive unless they are willing to pay. The change is already coming and social advertising spending is expected to increase by almost 200% in 2018 alone [note]https://www.invespcro.com/blog/social-media-ad-spending/[/note]. If you’ve decided to focus your entire marketing strategy on these two platforms just remember all of your marketing eggs are in one basket. When you rely entirely on third party platforms like social media you are essentially trusting the future of your restaurant’s online marketing on the algorithm of a profit driven machine. Make sure you own your brand. The most important marketing decision for a cafe or restaurant is to ensure that you command ownership over your own brand. The trouble with relying entirely on social media platforms is that they can’t always be trusted. What’s good today might not be good tomorrow and all it takes is an algorithm tweak and suddenly your posts are only being seen by 5% of your hard earned follower audience. Having a website allows you to command ownership over your brand and grow consistently over time. Small websites do not require significant maintenance as long as the SEO has been set-up correctly from the start and allows a direct connect for you to market your audience. If you have a business website but you’re not sure if it’s set up in the best way, reach out to an SEO guru that you trust to give you the right advice. In many cases a big website investment for a cafe or restaurant is never going to give a strong Return On Investment if you put too much money into it so be wary if someone is trying to sell you on an expensive SEO package. Your website should be an extension of the restaurant which communicates the message of the business while allowing customers to find you easily – simple with beautiful imagery, a clear message, and possibly a menu :). If you don’t have a website, but have all the photography and content ready to go it’s something you can do yourself. WordPress is an amazing website platform which we recommend. Hiring a developer for something simple but beautiful might set you back between $500 – $1000. Just make sure they know how to SEO it right from the start. Directory listings still command significant organic traffic and tend to rank strongly on Google Search. Websites such as Zomato and Trip Advisor will continue to be very influential for local businesses so it’s worth making sure that they are being managed effectively. Referrals from 3rd party reviews can have a significant impact on bringing in new customers. But most importantly they allow a business to command ownership of its brand. Let’s look at Vegie Bar as an example. Every single link on the search result featured Vegie Bar. 50% of all listings on the front page were prominant directory pages featuring Vegie Bar. These listings that are managed by websites with huge SEO budgets that are trying to capitalise on the market. You might think this could reduce traffic to your homepage, or even remove the need for having a homepage at all. However our own research has shown the click through rates for directory listings featuring brands are lower when they compete with the brands own website. And a brands website commands significantly higher click through rates compared to any other pages when measuring branded keywords, such as ‘vegie bar’ shown above. In essence the homepage pulls in the majority of the traffic while the referral pages act as a safety net by catching traffic that isn’t hooked in right away. By flooding every single search result Vegie Bar commands the entire results page. No matter which link the user clicks, they will end up on a page featuring Vegie Bar. Having a homepage means most directly to the Vegie Bar homepage giving them absolute access to their customer base and reducing the number of customers who might go to subsequent pages in search results. 3rd party sites can form part of a powerful marketing strategy for restaurants because they offer low cost market capitalisation. Most of these sites are free, and while some might take a small fee for online bookings you can accurately measure the return on investment. If you find or feel like you’re paying too much for online bookings made through a 3rd party site then it’s a strong indication that you need to invest more in other channels. Depending how long your restaurant has been open you might find you have a lot of these listings already. This isn’t a bad thing. Search for your own restaurant in Google to see which 3rd party directories are most important for you. Only focus on those that come up in page 1 for your branded terms. Social media is and will continue to be a massive part of hospitality for the foreseeable future. So it’s understandable that Social is still a big part of the big 4 internet marketing strategies for cafes and restaurants. Facebook and Instagram are likely the two most influential platforms you will be using, but Twitter may also be useful too depending on your audience. Sync all social platforms together. Post once. Be seen by many. Save time by syncing multiple social channels together so they all see the same content. This not only saves a massive amount of time ongoing, but also allows brand consistency across multiple social channels. Our recommendation is to use HootSuite to schedule and post your Instagram posts. If you haven’t done so already, sync your account to your Facebook business page so that it instantly publishes the content on both platforms. If you have a twitter account you can do the same here too. If using WordPress use an Instagram plugin to feature your instagram posts as well. Schedule 1-2 weeks in advance with posts every 2nd day. Use Instagram Analytics to only post during the most active times and always publish with 30 hashtags in the description. Should I advertise through Instagram? The short answer to this is absolutely, yes. However! Not until you’ve completed the four steps above. Google My Business, your own site, directory listings and the quality of your instagram accounts should come first. Learning to advertise with small budgets consistently will allow you to develop these skills over time. It’s important to be malleable and prepared for how the climate might change in the future. Social algorithms might change entirely for businesses meaning the only way for them to reach their customers would be through paid advertising. When are the best days for restaurants to advertise on Instagram? Pick your best content and advertise closer to the weekend. Instagram ads have less targeting options which means it’s a lot easier to spend your money quickly. Choose a daily budget you’re happy to work with, select your best content and set the ad to run mid week from Thursday morning to Sunday morning targeting a range within 5-10km of the restaurant or cafe. You don’t always need to include a promotion in the ad, but if you include something that customers will reference when they come to the restaurant then you can see how the ads converted into actual customers. Should I invite influencers to my restaurant? Influencers have the ability to really boost your social presence, especially when you get the right ones. I would recommend to say yes more than no, especially if it’s just a free brunch. If the influencers are expecting to be paid to promote your product you will have to make a call to measure the long term value of being in their feed. Some influencers could charge up to $1000+ to promote your product, and while they might be experts at marketing themselves it doesn’t always mean that they’re experts at marketing for you, or that you’ll see a positive return from the investment. Algorithm changes happen frequently and while nearly everyone is an influencer a lot may not be appropriate. The best recommendation is to find medium sized influencers of 10,000 – 40,000+ followers within your target niche. They might take a small fee of $300 – $600, but they will also bring along a professional camera. As part of the arrangement ask if a portion (25%) of their fee will be used to boost the post through targeted advertising and whether they will send you a marketing report at the end of the period. Request for any extra photos to be sent through as well so you can add them to your own social strategy. This way you’re getting additional value that extends beyond a single Instagram post. Welcome influencers who have a strong following, but less than 10,000 followers for a complimentary meal. If they would like to boost the post through advertising propose a small budget of $30-$50 for a 3 day campaign from Thursday to Saturday at $10-$15 per day.